Look, Saints fans can look at a 47-10 score, think back on the history of the franchise, rejoice that it’s their team on the good end of that score and say “There but for the grace of God go I.” We all can sympathize with the fans of that team in Buffalo who had to watch their team take one of the worst beatdowns of anybody in the NFL this year. And it was a pretty legendary beatdown. When a team that has Drew Brees playin’ quarterback decides to run the ball 24 straight times – yes, twenty-four – because they’re crankin’ out first down after first down doin’ it, it’s a beatdown. It got so bad that Mark Ingram came out of the came after he ran for 130 yards and three touchdowns. Then Alvin Kamara came out of the game after he’d run for another 100 yards and another touchdown. 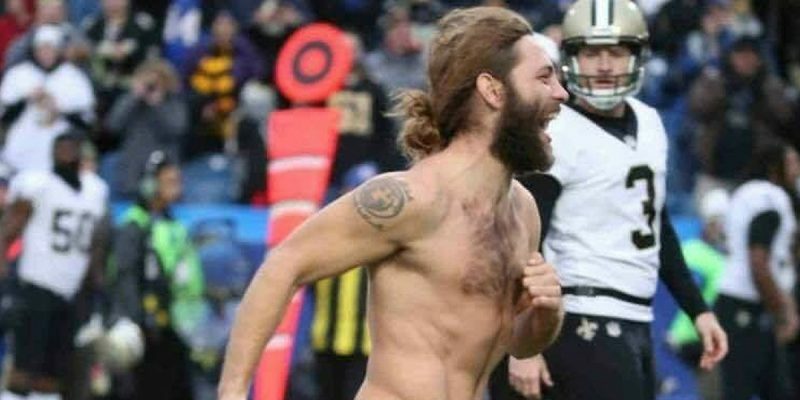 Then Breesus ran for a touchdown his own damn self. And so they put in the fourth string running back – the third-stringer, Daniel Lasco hurt his spine covering a kickoff and had to leave in an ambulance, but it sounds like he might be OK – to run the clock out, and Trey Edmunds proceeded to take off for a 40-yard touchdown toward the end of the game as the Saints’ sideline looked on sheepishlike (yo, guys, it ain’t runnin’ up the score when the fourth-string tailback houses one on you). By the end of the game they’d run for 301 yards. Nobody runs for 300 yards in an NFL game anymore, except the Saints did it. But there was a scene in the fourth quarter that Fox wasn’t gonna show, other than the whole Saints’ sideline was crackin’ up laughin’ and the announcers were doin’ everything they could do not to bust out as well. That was the streaker, who actually ran from end zone to end zone buck-naked in some 40-degree weather (meanin’ that his run might have been impressive, but not everything the folks in that buildin’ saw was impressive at that point. Bills fans have a reputation for bein’ animals of a sort. And while their team didn’t show much – which was a bit strange since they were 5-3 comin’ into the game, which might mean the Saints are just that good right now – they did a lot better job representin’. It’s all right here. This guy does a nice job puttin’ it all together.